When approaching the master solo strings, our initial thoughts were to begin with the solo violin, as out of the four main bowed string instruments, it is by far the most prominently used soloist instrument. With further consideration, we decided it might be perfect to focus and actually begin with a meticulously sampled solo Viola. 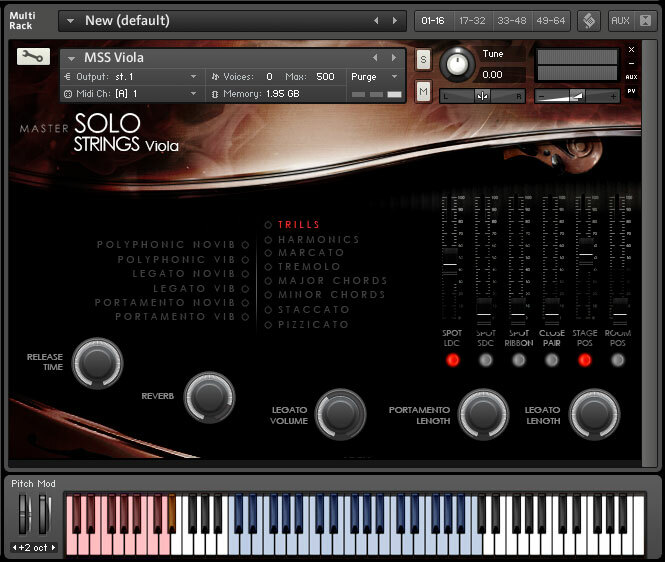 There are already many sampled violins, and we have contributed some ourselves, so lets open with the viola! Considering adding a violin solo to your score? The violin has a beautiful sound - no doubt about it - but consider giving an extra special colour to your music by adding a viola solo; a warmer/lusher and deeper sound, which listeners will be less accustomed to, and pleasantly surprised by. As you can see, there are four legato modes, normal legato with and without vibrato, and portamento with and without vibrato. Controls on the GUI allow you to also control the legato interval volume, as well as legato interval length, and portamento length, allowing for fast snappy note changes, more expressive drawn out intervals, or short/long slides between notes. You will need just over 10GB for the instrument, and almost double this for the extraction process.